Background: The aim of this study was to investigate whether the smear layer influences the removal of calcium hydroxide from the root canal with manual or rotary instruments. Materials and Methods: The root canals of 48 freshly extracted single-rooted maxillary incisors were prepared to apical size 40 (n=40) and finally irrigated with sodium hypochlorite (group A), or ethylene diamine tetra acetic acid (EDTA) followed by sodium hypo chlorite (group B). 20 teeth were assigned to each group, while the remaining eight teeth served as positive and negative controls. Each group was divided into two subgroups of 10 teeth (subgroup I - calcium hydroxide was removed with master apical file; subgroup II - with profile file); and, in all removal procedures, citric acid was used for irrigation. The percentage of calcium hydroxide-[Ca(OH) [Ca(OH) 2 ] coated surface area was calculated by image processing analysis. Results: Considering the root canal as a whole, the removal of Ca(OH) 2 from the dentinal walls in group B showed significantly better results (P<0.05) as compared to group A. Conclusions: Under the conditions of this study, it can be concluded that the smear layer is important in the removal of calcium hydroxide. It is necessary to provide a sterile root canal for successful root canal treatment. The removal of debris by using mechanical instrumentation may not always succeed in complete cleaning because of morphological and physical barriers. Consequently, the use of numerous irrigating solutions and antimicrobial temporary dressing materials is recommended for additional benefit. , Calcium hydroxide [Ca(OH) 2 ] has been used in dentistry for almost a century. The routine use of Ca(OH) 2 as an inter-appointment intracanal medicament has become widespread , owing to its bacteriological control of the canal environment, dissolution of soft tissue debris, promotion of the drying of weeping periapical lesions, and good biocompatibility. ,,, Ca(OH) 2 is kept into the root canal for various time periods (6 to 24 months for apexification and 1-4 weeks for intracanal medicament). Regardless of the aim of its use, Ca(OH) 2 in the root canal has to be removed completely before the root canal filling. Hosoyaet al. demonstrated that the sealing ability of Sealapex improved with the Ca(OH) 2 , which influenced the physical properties of other sealers used in their study. 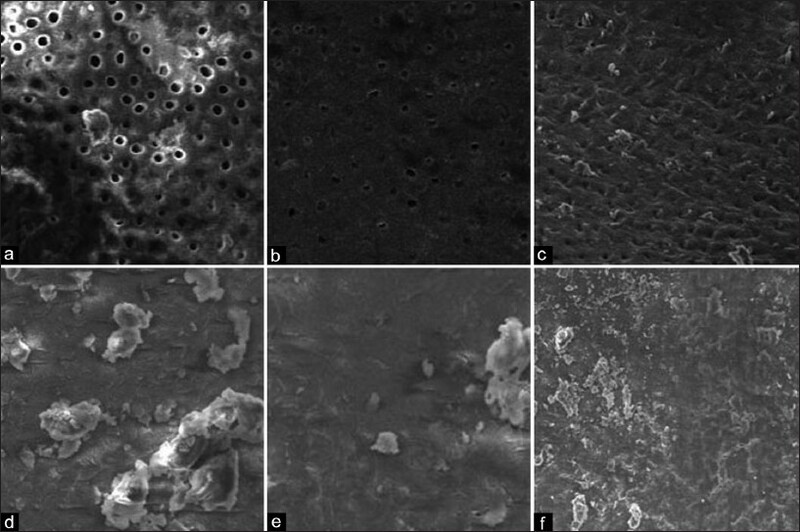 The other previous reports have demonstrated that remnants of Ca(OH) 2 reduce the bond strength of a resin-based sealer to root canal dentin,  interfere with the sealing ability of a silicon-based sealer,  increase the dye apical leakage of gutta-percha root fillings when a zinc oxide-eugenol sealer is used,  interact with eugenol-based sealers,  and prevent penetration of the sealer into dentinal tubules. Thus, complete removal of Ca(OH) 2 from the root canal becomes obligatory before root canal filling. Smear layer created during instrumentation is composed of inorganic particles of calcified tissue and organic elements. Studies analyzing whether the smear layer is beneficial or detrimental for the success of root canal treatment have been controversial. It may be beneficial because it reduces the permeability of the dentin and prevents or slows the penetration of bacteria into the dentinal tubules. However, some authors have supported the removal of the smear layer because it prevents irrigants, medicaments, and filling materials from penetrating into the dentinal tubules and even from contact with the canal wall. However there is no study that investigated the effect of smear layer on the removal of Ca (OH) 2 . Hence, the purpose of this study was to investigate whether the smear layer influences the removal of calcium hydroxide from the root canal with manual or rotary instruments. Single-rooted extracted maxillary incisors were chosen for this study. Teeth were stored in normal saline solution and the solution was changed daily. The teeth were then stored for two days in 5% sodium hypochlorite (NaOCl) at room temperature to remove organic debris. Consequently, they were cleaned with ultrasonic scaler. Following the preparation of the coronal access cavity, root canals allowing the introduction of instruments exceeding size 40 as well as teeth with fractures, cracks, or any other defects were excluded from the study. Consequently, 48 straight teeth were selected. The lengths of the teeth were standardized at 18 mm from the apex (Digitall Slide Caliper, TchiboGmbh, Hamburg, Germany). The coronal portions of the canals were enlarged with Gates Glidden burs (Dentsply Maillefer, Ballaigues, Switzerland). The working lengths were established at 1 mm short of the apical foramen and then recorded for each canal. Each canal was instrumented using a combination of passive step back and rotary 0.04 taper nickel titanium files (Dentsply Maillefer, Ballaigues, Switzerland). The apical ends of the canals were enlarged to a size 40 file. The instruments were changed every five canals. One milliliter of 5% NaOCl delivered with a 31 gauge needle (NaviTip Sideport; Ultradent, Utah, United States of America) was used to irrigate the root canal between the use of each hand and rotary instrument. Before the final rinse, a size 20 file was passed 1 mm beyond the apex to remove any dentinal shaving plugs. The specimens were divided randomly into two groups of 24 teeth. The canals were treated with 5 ml of 5% NaOCl (group A). The canals were treated with 5 ml of 15% EDTA (Wizard; Rehber Chemical Co., Ltd, Istanbul, Turkey) for 1 minute, followed by 5 ml of 5% NaOCl (group B) [Table 1]. After that, two samples from both groups were stored as the negative control group and the canals were not filled. The remaining root canals were dried with paper points and then filled with Ca(OH) 2 (Metapex; Meta Biomed Co., Ltd., Cheongju, Korea) with a size 40 lentulo spiral until the material extruded through the apex. Two filled specimens from both groups were stored as positive controls. The access cavities were temporarily sealed with a cotton pellet and Cavit (3M ESPE, Seefeld, Germany). The teeth were stored at 37 o C and 100% relative humidity for 7 days. Then the temporary restorations were removed, and the teeth of each group were randomly divided in two subgroups that were treated as follows. Group A and group B were divided into 2 subgroups. In subgroup I, intracanal dressing was removed using MAF in a circumferential filing action and irrigation with 2.5 ml of 25% citric acid. In subgroup II, the dressing was removed using a Profile.04 file rotating at 300 revolutions per minute (MAF size) [Table 1]. Removal of the Ca(OH) 2 was performed as follows: First, a MAF (with circumferential filing action) or rotary instrument was introduced into the canal to the working length for seven seconds. Then the irrigation was performed with 0.5 ml of 25% citric acid. The MAF or rotary instrument was introduced to the canal again, and the instrumentation was performed for eight seconds with 0.5 ml of citric acid. Then the final flush of 1.5 ml of citric acid was performed. The total citric acid volume was 2.5 ml in each canal. After each technique, canals were irrigated with 5 ml of 5% NaOCl and then dried with size 40 paper points. The means and standard deviations were calculated from the collected data, and the Kruskal-Wallis and Mann-Whitney U tests were then performed to determine the significance between the parameters (smear layer, the instrument type, and the region of the root canal). Remnants of Ca(OH) 2 were found in all experimental groups regardless of the absence/presence of smear layer or the removal technique [Figure 2]. The positive control group revealed complete coverage of the canal walls with Ca(OH) 2 , in contrast to the negative controls. Considering the root canal as a whole, the removal of Ca(OH) 2 from the dentinal walls in group B (mean rank=54,18) showed significantly better results (P<.05) than the group A (mean rank=66,84). [Table 2] shows the mean ranks for the removal of Ca(OH) 2 for groups A and B within the variable coronal, middle, and apical thirds. The Mann-Whitney rank sum tests for pairwise comparisons found a significant difference between the apical and the middle/coronal thirds (P=0.017 and P=0.000, respectively) for group B; however, there was no significant difference between all canal sections for group A. The Kruskal-Wallis tests found significant differences among the canal sections for each technique. The Mann-Whitney rank sum tests for pairwise comparisons found a significant difference between group AII and BII within the coronal and middle sections at P<0.05. Also, there was a significant difference between group AI and BI within the apical section at P<0.05. The removal technique with the profile in group B showed much better efficiency than the removal technique with a manual file in group A or the profile in group B (P<0.05). However, in group A, the manual technique was more effective in the removal process than the rotary file (P=0.016). For the negative control group the following results were observed: Group A was heavily smeared in all 3 sections. Most of dentinal tubules were closed and covered with smear layer. Group B showed complete smear layer removal in the middle and coronal sections. However, in the apical part, moderate smear layer was observed. The techniques for measuring the residual materials in the root canals varied. One commonly used technique for measuring residual Ca(OH) 2 involves sectioning the teeth longitudinally and taking photos. ,, Additionally, the advantages of this technique are: (i) more accurate measurement of the complete canal area and (ii) confirming canals to be free of debris before a removal technique is employed. Additionally, a radiographic analysis provides a 2-dimensional view and has proved less effective than the cleavage method. However, if this method is not used correctly, the Ca(OH) 2 remnants could be displaced. This method should be done to avoid touching the root canal wall. In this study, the amount of remnant Ca(OH) 2 was evaluated by longitudinal cleavage measurements and quantitative analysis. Saline, water, NaOCl, EDTA, citric acid, and combinations of the substances have been used as irrigants for removing intracanal medicament. It is known that NaOCl and saline fail to completely remove Ca(OH) 2 from the root canal. Citric acid and EDTA were found to be significantly more effective than NaOCl and water. In contrast, Nandini et al. found that citric acid performed better in comparison to EDTA solution in removing Ca(OH) 2 containing silicone oil. Furthermore, they asserted that the EDTA chelates calcium ions in water; however, citric acid is able to penetrate the silicone oil better in comparison to EDTA and chelates the calcium ions. In this study, citric acid was chosen as irrigant during removal because the vehicle used in the present study was silicone oil. Within the limitations of this study, Ca(OH) 2 was removed more efficiently in the smear-free group compared with the other experimental group with smear layer. Thus, first, it can be concluded that smear layer is important in the removal of Ca(OH) 2. Second, the results of this study demonstrated that in the smear-free group rotary files were more efficient than manual files. The authors deny any financial affiliations related to this study or its sponsors. 1. Wadachi R, Araki K, Suda H. Effect of calcium hydroxide on the dissolution of soft tissue on the root canal wall. J Endod 1998;24:326-30. 2. Siqueira JF Jr, de Uzeda M. Intracanal medicaments: Evaluation of the antibacterial effects of chlorhexidine, metronidazole, and calcium hydroxide associated with three vehicles. J Endod 1997;23:167-9. 3. Sjogren U, Figdor D, Spangberg L, Sundqvist G. The antimicrobial effect of calcium hydroxide as a short-term intracanal dressing. IntEndod J 1991;24:119-25. 4. Orstavik D, Haapasalo M. Disinfection by endodontic irrigants and dressings of experimentally infected dentinal tubules. Endod Dent Traumatol 1990;6:142-9. 5. Siqueira JF Jr, de Uzeda M. Disinfection by calcium hydroxide pastes of dentinal tubules infected with two obligate and one facultative anaerobic bacteria. J Endod 1996;22:674-6. 6. Fernandes M, de Ataide I. Nonsurgical management of periapical lesions. J Conserv Dent 2010;13:240-5. 7. Garcia L, Cristiane S, Wilson M, Soraya M, Lopes RA, Mônica R, et al. Biocompatibility assessment of pastes containing Copaiba oilresin, propolis, and calcium hydroxide in the subcutaneous tissue of rats. J Conserv Dent 2011;14:108-12. 8. Siqueira JF Jr, Lopes HP. Mechanisms of antimicrobial activity of calcium hydroxide: A critical review. IntEndod J 1999;32:361-9. 9. Hosoya N, Kurayama H, Iino F, Arai T. Effects of calcium hydroxide on physical and sealing properties of canal sealers. IntEndod J 2004;37:178-84. 10. Barbizam JV, Trope M, Teixeira EC, Tanomaru-Filho M, Teixeira FB. Effect of calcium hydroxide intracanal dressing on the bond strength of a resin-based endodontic sealer. Braz Dent J 2008;19:224-7. 11. Contardo L, De Luca M, Bevilacqua L, Breschi L, Di Lenarda R. Influence of calcium hydroxide debris on the quality of endodontic apical seal. Minerva Stomatol 2007;56:509-17. 12. Kim SK, Kim YO. Influence of calcium hydroxide intracanal medication on apical seal. IntEndod J 2002;35:623-8. 13. Margelos J, Eliades G, Verdelis C, Palaghias G. Interaction of calcium hydroxide with zinc oxide-eugenol type sealers: A potential clinical problem. J Endod 1997;23:43-8. 14. Calt S, Serper A. Dentinal tubule penetration of root canal sealers after root canal dressing with calcium hydroxide. J Endod 1999;25:431-3. 15. Lambrianidis T, Margelos J, Beltes P. Removal efficiency of calcium hydroxide dressing from the root canal. J Endod 1999;25:85-8. 16. Salgado RJ, Moura-Netto C, Yamazaki AK, Cardoso LN, de Moura AA, Prokopowitsch I. Comparison of different irrigants on calcium hydroxide medication removal: Microscopic cleanliness evaluation. Oral Surg Oral Med Oral Pathol Oral RadiolEndod 2009;107:580-4. 17. Kenee DM, Allemang JD, Johnson JD, Hellstein J, Nichol BK. 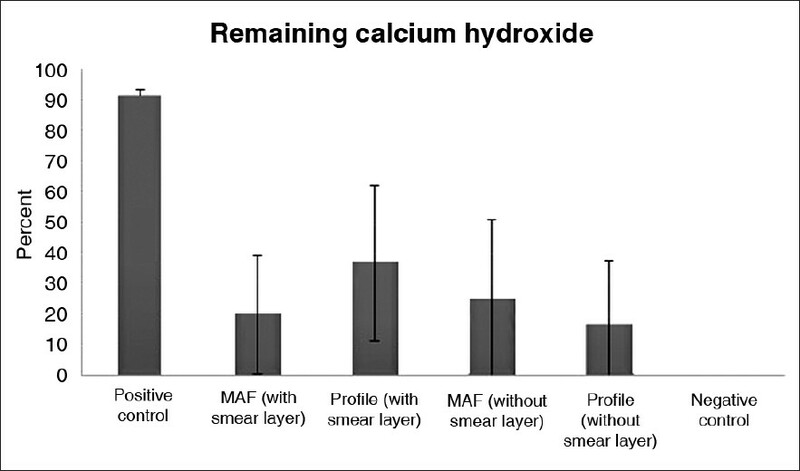 A quantitative assessment of efficacy of various calcium hydroxide removal techniques. J Endod 2006;32:563-5. 18. van der Sluis LW, Wu MK, Wesselink PR. A comparison between a smooth wire and a K-file in removing artificially placed dentine debris from root canals in resin blocks during ultrasonic irrigation. IntEndod J 2005;38:593-6. 19. Balvedi RP, Versiani MA, Manna FF, Biffi JC. A comparison of two techniques for the removal of calcium hydroxide from root canals. IntEndod J 2010;43:763-8. 20. Nandini S, Velmurugan N, Kandaswamy D. Removal efficiency of calcium hydroxide intracanal medicament with two calcium chelators: Volumetric analysis using spiral CT, an in vitro study. J Endod 2006;32:1097-101. 21. Dippel HW, Borggreven JM, Hoppenbrouwers PM. Morphology and permeability of the dentinal smear layer. J Prosthet Dent 1984;52:657-62. 22. Mader CL, Baumgartner JC, Peters DD. Scanning Electron-Microscopic Investigation of the Smeared Layer on Root-Canal Walls. J Endodont 1984;10:477-83. 23. Torabinejad M, Khademi AA, Babagoli J, Cho Y, Johnson WB, Bozhilov K, et al. A new solution for the removal of the smear layer. J Endod 2003;29:170-5. 24. Rodig T, Vogel S, Zapf A, Hulsmann M. Efficacy of different irrigants in the removal of calcium hydroxide from root canals. IntEndod J 2010;43:519-27. 25. Takahashi CM, Cunha RS, de Martin AS, Fontana CE, Silveira CF, da SilveiraBueno CE. In vitro evaluation of the effectiveness of ProTaper universal rotary retreatment system for gutta-percha removal with or without a solvent. J Endod 2009;35:1580-3. 26. Lambrianidis T, Kosti E, Boutsioukis C, Mazinis M. Removal efficacy of various calcium hydroxide/chlorhexidine medicaments from the root canal. IntEndod J 2006;39:55-61. 27. Saito K, Webb TD, Imamura GM, Goodell GG. Effect of shortened irrigation times with 17% ethylene diamine tetra-acetic acid on smear layer removal after rotary canal instrumentation. J Endod 2008;34:1011-4.